Why should you know more about coaxial cables? – Because they’re used for more than just connecting cable and satellite receivers. 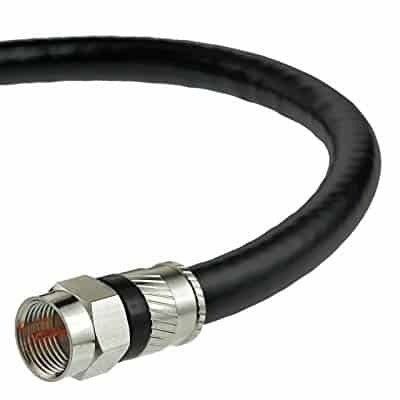 Knowing the difference between the best coaxial cables and the mediocre ones is how you can ensure to maintain your AV quality and high-speed internet connection. But, this is not always easy. On the surface they may all look alike. However, just because you can’t see the interior architecture doesn’t mean that you can’t deduce what’s better for you by understanding some of the key features of coax cables. If you’re unsure what to get, check out my following favorite picks of coaxial cables with F-type connectors. What Type of Shielding Should You Get? What Does Warranty Tell You? Getting a durable coaxial cable is perhaps the most important thing when you’re looking to buy one. 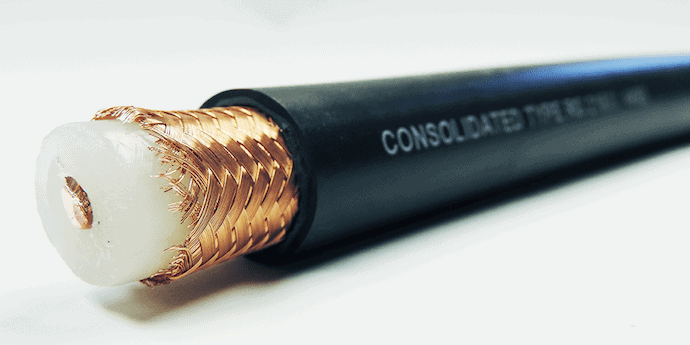 Mediabridge knows how to guarantee the life of their coaxial cables by using a high quality jacket and insulation – the latter prevent premature oxidization of the copper conductor. This cable is triple shielded to prevent signal interference. This is especially important if you have to run long cables. This cable works with all devices that have F-type input connector, such as TVs, cable modems, satellite receivers, etc. The triple layer of aluminum shielding also makes it a good choice for in-wall use, and the fact that you can choose between multiple lengths means that room dimensions are not an issue. The connectors are nickel plated so they can withstand the test of time. You can run the cable outdoor, but don’t expose the connectors outside. The jacket will take care of most outdoor elements. The connectors have an easy grip. This will allow you to simply slide them in and twist. A Velcro strap is also included for cable organization. You can get this RG6 coax cable in varied lengths between 4 and 100 feet. If you’re looking for an all-around solution, you may be in luck because the durability of the CL2 allows it to be used both indoors and outdoors, as well as in-wall. All coaxial cables that carry video signal have to be rated at 75 ohm, and that’s the case for this one as well. That’s to prevent signal loss. It makes the CL2 useful when used with satellite or cable receivers, police scanners, etc. Any device you can think of with an F-type port will work with the CL2’s nickel plated connectors. The design of the connectors also looks a lot more modern than what you may expect from traditional coax cables. Because of the high-end shielding, the CL2 should be able to provide very clear visual and audio signals by eliminating most of the electromagnetic or radio frequency interference. The shielding also contributes to the noise-cancelling ability, so it might make an even better choice for a home theatre room. What the KabelDirekt Pro Series cables lack in extra shielding they sure make up for in price and through their corrosion resistant connectors. The cables can be found at various lengths although you’re unlikely to need the longer ones if you’re just using them for standard AV connections. 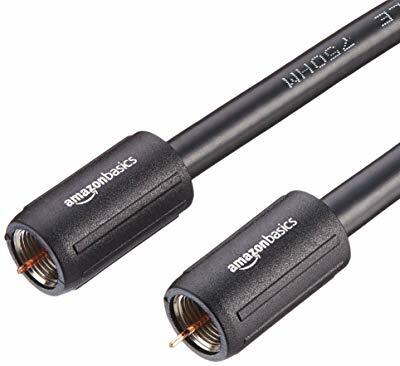 However, you may use them both inside and outside due to their gold plated connectors which are anticorrosive and great at minimizing interference. 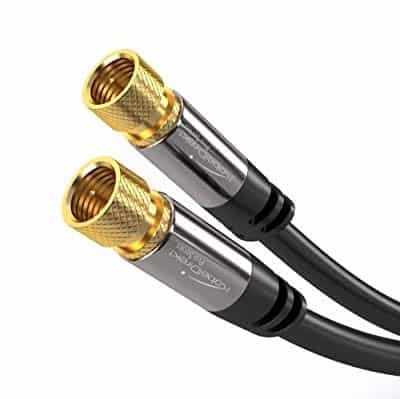 This cable is terminated on both ends with make F-type connectors, as is the case with all coaxial cables in this review. Now, although the KabelDirekt Pro Series can work in a variety of applications, it is actually designed mostly for satellite receivers. If that’s what you’re looking for, you may just found yourself a solution. You can also use it to upgrade the “free” cable that comes with your satellite TV installation. This cable is only double shielded. This is usually more than enough for the shorter lengths. 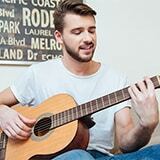 However, you might not want to use it inside a wall where there’s a lot electrical wiring. 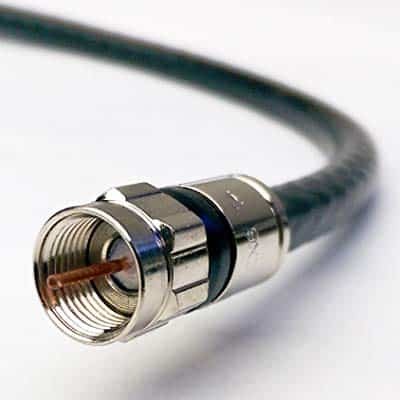 One of the best features of this coaxial cable is the 10-year warranty that it comes with. If you have ever worried about durability or signal loss issues, The Cimple Co seems to have its customers covered on a long-term basis. This cable is designed to work with a variety of receivers, modems, antennas, as well as mobile phone wireless extenders. Although white cables seem generic both at home and in an office setting, there’s no denying the connectivity possibilities. When it comes to signal retention, this RG6 cable does its job. The installation may not be as easy as you would like, especially if you lack the skill or tools for the job, but it’s worth the wait if your aim is to preserve the signal integrity. The UV-resistant PVC jacket gives this coax cable the robustness it needs to withstand exterior conditions. Whether it’s the rain, snow, or scorching heat, your AV quality should remain top-notch. And, if the long warranty wasn’t enough to convince you then perhaps the true 75 ohm impedance will convince you that signal loss should not be an issue. 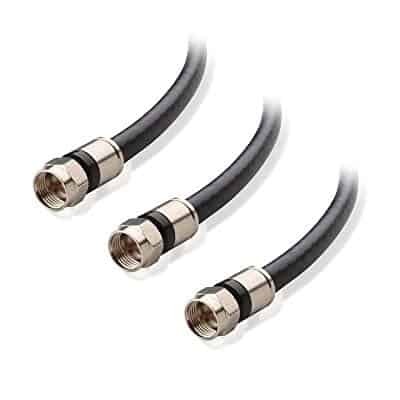 If you want to go out of your way for extra shielding then perhaps the quad shielding on the Cable Matters 3-Pack coax cable is what you’re looking for. It’s a bit pricier than most coaxial cables on the market except those overpriced audiophile brands. But you’ll be getting your money’s worth with this cable in the form of excellent protection against signal interference. The cable is ideal for carry video and digital signal due to its honest 75 ohm impedance. It’s also applicable for interior, exterior, as well as in-wall use, not just because of the durable jacket but also because of its CM and CL2 safety ratings. Although at first glance it’s tempting to believe that four layers of shielding create a still cable, Cable Matters managed to pull off a very flexible RG6 coax cable design. On top of that, the connectors are low-profile for easy reach into tight places. Due to the superior signal loss protection, this cable may be used with any satellite dish networks or DirectTV receivers with a frequency of up to 3 GHz. 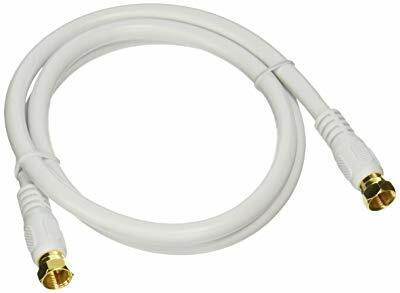 Another heavy-duty coax cable is the Monoprice 104057. This cable has a lifetime warranty and a robust quad shielding that protects against RF interference and signal loss. If you’re looking for a reliable way to minimize unwanted noise while shopping on a tight budget, this is a solid choice. The cable is designed for long-distance data transfer so it’s a good choice if you want to connect multiple offices together. Although it’s optimized for 2200 MHz, the cable also has a 75 ohm rating which means it’s still good for all video and digital signals. The durability doesn’t begin and end with the quad shielding. The connectors are also corrosion-resistant which means you can easily make this the outside coax cable of choice for your office, studio, or home. The cable is also available in both black and white, so you won’t have to worry too much about appearances either. Although this coax cable doesn’t carry a premium price tag, its performance is nothing short of impressive. The brass compression connectors are equipped with an o-ringed weather seal which provides superior resistance to harsh weather conditions. This quad–shielded cable offers sufficient protection against electromagnetic and radiofrequency interference, which may result in signal loss or unwanted background noise especially if you have to run long cables. Due to its robust nature, this cable may be your best solution as an in-wall cable in a large office. It may also serve you well if you want to connect something from the main house to the guest house without worrying about loss of signal. The 75 ohm impedance provides consistent AV quality and the 3 GHz range also makes it a solid choice for broadband receivers and satellite TV. You may also put this cable to good use if you have a proper antenna. I’m not the type to get butterflies in my stomach just because I see a triple or quad-shielded coax cable in the product description. While it is true that the more layers of shielding a cable comes with the better it’s protected against interference and signal loss, this often comes at a high price. The shielding is usually not a big deal for short cables. But it’s a different story if you have to run long cables in an area with lots of RF and EM interference. Otherwise, you won’t need more than a double or triple layer of shielding. You’ll need a minimum of three layers if you’re looking at an in-wall setup. That’s for all the electrical wiring in your wall. But, depending on the manufacturer, three doesn’t always equal three. The design and manufacturing can also make a difference. It takes layers of dielectric and foils to execute proper shielding, and it shouldn’t leave gaps during the manufacturing process. Most coax cables tend to come with nickel-plated connectors. These are generally cheap but they’ll still get the job done. Me? – I don’t mind paying a bit extra on for solid connectors. Gold-plated or brass connectors are my preferred choices. These have better anti-corrosive properties to protect against oxidization. An oxidized connector can change the impedance of your cable, so it might not be a true 75 ohm anymore. Also, some connectors come with additional waterproof features like o-ring seals or special coatings. Those might also be worth looking into if you need to purchase coax cables for outdoor use. Not all coax cables carry warranties that may sway you into buying them. However, when you do see a coax cable with 5 or more years of warranty, you should give it a second thought. A long warranty generally indicates a superior level of build quality. And even if that’s not the case, at least you can get it replaced or repaired free of charge. Coax cables may seem to all do the same thing, especially when you’re talking about F-type connectors. After all, they plug into pretty much the same input F-type connectors, right? Well, although coax cables look alike on the outside, the build layout will differ, and this can make all the difference in the world. Check the impedance rating as well as the frequency range before you buy a coax cable. 75 ohm is the impedance needed to carry video and digital signals without excessive jitter. Coax cables are an integral part of any home, office, studio, shopping center, you name it. These cables are used to transfer signal through a variety of devices, and they’re designed to minimize interference and signal loss. 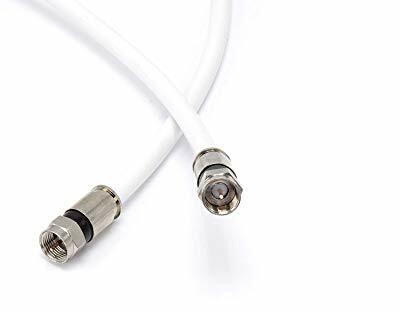 If you’re looking for some cables to link up your devices, I’ve listed above some of the best coaxial cables for all sorts of budgets. While picking one, keep in mind your specific use cases rather than wondering what the absolute best option is.